I just got back from my local music radio show on (currently) internet only WBKM. I highlighted some of the cool music that will be happening in town this week, highlighted some of the music from around New England, and said Happy Birthday to Alice Austin. From our small city to the great big world, these are the Sounds of Burlington. I usually play a lot of music from bands who play in Burlington and from all over Vermont, but tonight let’s take a trip around New England and check out some cool songs from the past and present. Particles used to live in Maine but have moved to New Hampshire. They will be doing a tour soon, so check them out if you like to rock. Slowdim are from Boston and have some amazing songs. The Mockingbirds were a 90’s band from Rhode Island. That’s such a great song, and highlights the struggle for musicians to be able to get health care, among other things. Lendway were from Vermont and I miss them. Michael moved to California but the other three guys formed The High Breaks and Matt Hagen is in a few other bands too. OK, it’s time for the next song on the album Bernie Sanders recorded with 30 VT artists back in the 80’s. That’s another song from their brand new album Callisto. I had to play the Aaron song because it’s so good, and it’s been raining so much today it reminds me of an underwater kingdom. I love the song about Bernie that really highlights how Bernie’s policies, when enacted, can help make a beautiful city and help people get health care, even musicians. The imagery in that song is so clear. I love the song by Bernie that shows how he has kept the same message for such a long time. Unwavering. One of the great musicians to come out of Burlington has a birthday today. Here is a tiny bit of the music that she has brought to this world. I had to play Rain, since it’s been such a damp day. That is from a recent ep. Wing is from her solo album To A Star In The Yard. Alice started in Zola then moved to QT, then The Lavas before heading out on her own. Thanks for all the great music Alice!! OK, this next song has been running though my head lately. Those are the closing two pieces form Wren’s new album For Evelyn. He is doing a release show for the album tomorrow. Binger are playing tomorrow at Radio Bean. This next band just had their Kickstarter funded and have begun recording their first full album. It can be a wild ride to see if a band gets a Kickstarter funded and I’m so glad they made it. Here is one form their first EP. Such a lovely and powerful song from Crow. They are from Rutland. Machines are from Boston and come to Burlington now and then. That was recorded in February this year at Nectar’s. Great song from Myra. I hope you enjoyed checking out the music of our town. Let’s do it again next week. Ta ta. As always, I want to thank everyone who made tonight’s show possible. Thanks to: stellastarr* official page, Persian Claws, La Dee, Jeremy Frederick, Lendway, Michael Clifford, Matthew Bryan Hagen, Todd Gevry, Kevin Lynam, Slowdim, Ana Karina DaCosta, Paul Sentz, When Particles Collide, Chris Viner, Sasha Alcott, Bernie Sanders, Aaron Flinn, Alpenglow, Alice Austin, Julia Austin, Black Rabbit, Marc Scarano, Darlene Scarano, ROUGH FRANCIS, Urian Hackney, Bobby Hackney Jr., Julian Hackney, Paul Comegno, Savage Hen, Mac Swan & Black Holly, BE AGGRESSIVE, Keeth Maurice, Jawknee Brochu, Phil Yates & The Affiliates, Phil Yates, Raph Worrick, Jacob Blodgett, Binger, Shakir Stephen, Dalton Muzzy, Braden Winslow, Wren Kitz, Kat Wright & The Indomitable Soul Band, Kat Wright, Bob Wagner, Hayley Jane and the Primates, Split Tongue Crow, Matt Marro, David Anderson, Jane Boxall Percussion, Fish, Slingshot Dakota, Carly Comando, Tom Patterson, Chris Farnsworth, Active Heed, Umberto Pagnini, Seth Yacovone Band, Waylon Speed!, Kelly Ravin, The Tragically Hip, MIDLAKE BAND, Adrian Belew, Alice Cooper, Ace Frehley, Iron Maiden, Marillion, Steven Rothery, The Church Band, jane siberry, Kate Bush, Joshua Glass Music, WBKM, and everyone else!!! 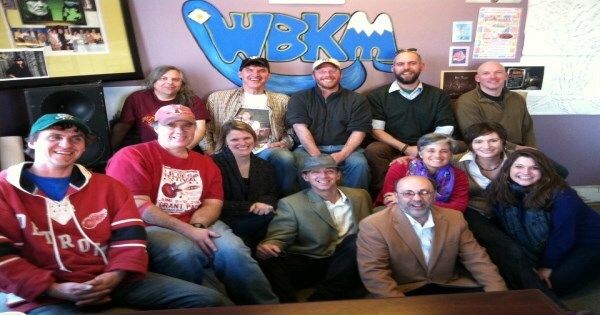 I just got back from my 98th local music radio show on internet only Wbkm Dot Org. I know it’s almost Valentine’s Day, but I focused more on the minerals that make up our bodies and our earth. From our small city to the great big world, these are the Sounds Of Burlington. It’s a cold snowy night in Burlington but lots of people are walking around and not letting it get them down. Last week I talked about how much of our bodies are made of water. Tonight, I will talk about the remaining amount of minerals, the dust that we are, the dust from where we came and the dust we will become. The earth is a medium where things grow out of and into our world. We start as dust and grow into the world and eventually will return to the dust. Let’s begin tonight with Anais Mitchell and Our Lady Of The Underground on WBKM, and this is Burlington’s Kind Of Music. We all started from the same root indeed. Humankind began and grew into branching civilizations but we all started from the same root and from the same soil. The soil allows seeds to grow into the world and create flowers and new seeds to go back into the soil, and continue the cycle. Maryse played a sweet version of that Saturday at Radio Bean. Can’t wait to see Elephants in Montreal playing as a side part of the Marillion weekend. OK, let’s step away from the theme and play the next song on Many Things & Many Scenes. If you want to be out in the pines under a blanket of snow, Vermont is the place to be. It’s so beautiful at this time of year. Nice song from GW. Musicians often start as fans and have other bands that influence the roots of the music they will create. Let’s play a couple of covers and look at some band roots. Ending where we began with that set. The last two were from the Burlington Does Burlington album from many years ago. I love the songs of the band Swale but every once in a while they do a show of cover songs and let people sign up and sing them. They call it Swaleoke. It’s a mixture of pro and amateur singers. A couple of times ago they said I had to sing a song at one, and will do so Saturday night at Radio Bean. I can’t sing so it’s going to be weird. Until then, here is a true Sale song. Oil is part of the earth and helped humankind evolve to where we are but hopefully we can get off it soon. Granted that song is about the X-Files but it’s good to get off that oil too. BT are playing at Nectar’s on Monday and I hope to catch them. Binger are playing on Tuesday and many other days this week. I’m so psyched for the Death World Wide show coming up at the Flynn Theatre tomorrow. This set goes out to my brother Ken who will join me. It’s going to be a great show. Nice cover story in the Burlington Free Press today. I thought I would not have any new songs to play and just before I headed down to the show I got this super brand new song. Great song from the Boston band that I’d love to have someone bring to town sometime. Nice earthy songs from the Vermont and Canadian bands. I hope you enjoyed checking out the music of our town. Let’s do it again next week, shall we?